Who decides what you see on TV, hear on the radio, click on the Web, or read in a magazine? And who pays for it? Authors David Verklin, CEO of one of the world's largest media-buying agencies, and marketing expert Bernice Kanner are going to tell you. 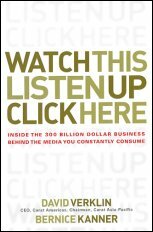 In Watch This, Listen Up, Click Here, they draw the curtain back to expose the money, personalities, and politics that control the billion-dollar business behind the media you constantly consume. Back when three networks dominated broadcast TV and the Internet was something only computer geeks had heard of, reaching consumers was easy. Companies could place an ad in a magazine or buy some time on TV or the radio and be sure that millions of captive consumers would know about their product -- whether they wanted to or not. But cable, the Internet, and other forces are breaking that audience down into ever-smaller groups interested in niche topics. And the media industry is responding in fascinating ways. Rather than advertise to everyone, today's marketers have become much more savvy, targeting smaller groups with special interests across a much larger range of media. Their success at finding the audience has made media buyers -- the professionals who buy ad space and decide which ads go in what media in which concentrations -- the kings of media. This is where Verklin's company, and others like it, come in. Marketing and advertising are changing rapidly. Where they go from here and how they will affect our lives and reflect our values in the future is the basis of this book. You'll learn the real reason your favorite shows get cancelled, why Oprah gives away Pontiacs to audience members, why billboard advertising is actually on the rise, how technology is growing the TV audience, and other changes brought about by the decisions made by those who control what we watch, click, see, and hear every day.